Hawker Siddeley was a group of British manufacturing companies engaged in aircraft production. Hawker Siddeley combined the legacies of several British aircraft manufacturers, emerging through a series of mergers and acquisitions as one of only two such major British companies in the 1960s. In 1977, Hawker Siddeley became a founding component of the nationalised British Aerospace (BAe). Hawker Siddeley also operated in other industrial markets, such as locomotive building (through its ownership of Brush Traction) and diesel engine manufacture (through its ownership of Lister Petter). The company was once a constituent of the FTSE 100 Index. Hawker Siddeley Aircraft was formed in 1935 as a result of the purchase by Hawker Aircraft of the companies of J. D. Siddeley, the automotive and engine builder Armstrong Siddeley and the aircraft manufacturer Armstrong Whitworth Aircraft. At this time, Hawker Siddeley also acquired A.V. Roe & Company (Avro), Gloster Aircraft Company (Gloster) and Air Training Services. The constituent companies continued to produce their own aircraft designs under their own name as well as sharing manufacturing work throughout the group. During the Second World War, Hawker Siddeley was one of the United Kingdom's most important aviation concerns, producing numerous designs including the famous Hawker Hurricane fighter plane that, along with the Supermarine Spitfire, was Britain's front-line defence in the Battle of Britain. During this campaign, Hurricanes outnumbered all other British fighters, combined, in service and were responsible for shooting down 55 percent of all enemy aircraft destroyed. In 1945, the Hawker Siddeley purchased Victory Aircraft of Malton, Ontario, Canada from the Canadian government, renaming the company A.V. Roe Canada, commonly known as Avro Canada, initially a wholly owned subsidiary of Hawker Siddeley. Avro Canada underwent a major expansion through aircraft development and acquisition of aircraft engine, mining, steel, railway rolling stock, computers, electronics, and other businesses to become, by 1958, Canada's third largest company directly employing over 14,000 people and providing 45% of the parent company's revenues. During its operation, Avro Canada aircraft (built) included the C102 Jetliner, CF-100 Canuck, CF-105 Arrow and VZ-9- AV Avrocar. Only the CF-100 fighter entered full-scale production. Other design projects (not built) included supersonic transport (SST) passenger aircraft, a mach-2 VTOL fighter, hovercraft, a jet engine-powered tank, and the hypersonic Space Threshold Vehicle. After the cancellation of the Arrow, the company began to unravel. In 1962, A.V. Roe Canada was dissolved and the remaining assets were transferred to the now defunct Hawker Siddeley Canada. Royal Air Force Hawker Siddeley Hawk T.1A, with its pilot. This aircraft, used for aerobatic displays, is in a special colour scheme. In 1948, the company name was changed to Hawker Siddeley Group. The aircraft division would become Hawker Siddeley Aviation (HSA) and the guided missile and space technology operations as Hawker Siddeley Dynamics (HSD). In 1959, the aero engine business, Armstrong Siddeley was merged with that of the Bristol Aero Engines to form Bristol Siddeley. In the late 1950s, the British government decided that with the decreasing number of aircraft contracts being offered, it was better to merge the existing companies, of which there were about 15 surviving at this point, into several much larger firms. Out of this decision, came the "order" that all future contracts being offered had to include agreements to merge companies. In 1959, Folland Aircraft was acquired, followed by de Havilland Aircraft Company and Blackburn Aircraft in 1960. In 1963, the names of the constituent companies were dropped, with products being rebranded as "Hawker Siddeley" or "HS". In this period, the company developed the first operational, and, by far, the most successful VTOL jet aircraft, the Harrier family. This aircraft remained in production into the 1990s and remains in service. In 1948, Hawker Siddeley acquired a factory in Kingston upon Thames, Surrey, on the Richmond Road near Ham. This was to become their main aircraft factory and headquarters. In 1957, Hawker Siddeley purchased the Brush group of companies that included Brush Electrical Machines, and Brush Traction, which manufactures electromotive equipment and railway locomotives. The Brush prototype locomotives Falcon, and the futuristic but over-weight HS4000 'Kestrel', were produced there. Other railway engineering assets were acquired, including Westinghouse Brake & Signal and the engine builder Mirrlees Blackstone, which came with the Brush businesses. In the early 1970s, Hawker Siddeley's Canada Car and Foundry subsidiary began to build rapid transit vehicles for the North American market. The first order was for the Port Authority Trans-Hudson line and consisted of 46 PA-3 cars numbers 724–769, which were largely based on the original hexagonal profile PA-1 & PA-2 cars designed and built by the St. Louis Car Company during 1966–67. Later Hawker Siddeley would sell the same general design to the MBTA in Boston for their Blue and Orange Lines. 70 48' cars were delivered to the Blue Line in 1978–80 and 120 65' cars were delivered to the Orange Line in 1980–81. Hawker Siddeley also manufactured much of the Toronto subway system's older rolling stock, the H5 and H6 models. The heavy rail manufacturing business, based in Mississauga and Thunder Bay, Ontario, are now part of Bombardier Transportation. MBTA also bought a number of commuter rail coaches from the German firm Messerschmitt, thereby teaming Hawker Siddeley with its old World War II rival under the same organisation. On 29 April 1977, as a result of the Aircraft and Shipbuilding Industries Act 1977, Hawker Siddeley Aviation and Dynamics were nationalised and merged with British Aircraft Corporation (BAC) and Scottish Aviation to form British Aerospace. However, HSA and HSD accounted for only 25% of the Hawker Siddeley business by this time, and the non-aviation and foreign interests were retained by a holding company known as Hawker Siddeley Group Plc after 1980. The group rationalised in the 1980s, focusing on railway engineering and signalling, industrial electronics and instrumentation and signalling equipment. Orenda Aerospace, the only remaining original company from the Avro Canada / Hawker Siddeley Canada era, although greatly diminished in size and scope of operations, became part of the Magellan Aerospace Corporation. The late 1980s also saw Hawker Siddeley divest itself of much of its other North American heavy manufacturing enterprises. Its Talladega, Alabama-based TreeFarmer heavy equipment business was sold to Franklin Equipment in 1990 and its Canadian rail car production facilities were split between SNC-Lavalin and Bombardier in 1992. 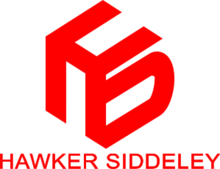 In 1992, Hawker Siddeley Group Plc was acquired by BTR plc for £1.5bn. In 1973, HS acquired the industrial electronics firm South Wales Switchgear. Later known as Aberdare Holdings, in 1992 this company was renamed Hawker Siddeley Switchgear (HSS). They have an Australian subsidiary, Hawker Siddeley Switchgear Australia. Another company which retains the name is Hawker Siddeley Power Transformers. In 1993, British Aerospace sold its corporate jet product line to the American Raytheon Aircraft Company. In 2006 the product line was sold to a new company to be known as Hawker Beechcraft, owned by Onex Partners and Goldman Sachs. The Hawker Siddeley name was not used to brand aircraft until 1963. Prior to this, aircraft were produced under the name of the subsidiary company (e.g. Hawker Hurricane, Hawker Sea Hawk, Gloster Javelin, Gloster Meteor). First flight date is in parentheses. HS.121 Trident (1962) – originated as de Havilland DH.121 airliner. P.139B – AEW and COD aircraft project. HS.141 (1978/1979) – V/STOL airliner project submission. HS.146 (1981) – entered production and later renamed the BAe 146. HS.748 (1960) – originated as Avro 748 turboprop airliner. Airbus A300 – Hawker Siddeley designed and built the wings of the A300 airliner. Argosy (1959) – known as Armstrong Whitworth Argosy until individual "brands" dropped in 1963. Built by Hawker Siddeley during the early 1960s. The last Argosy was built in 1965. Buccaneer (1958) – originated as the Blackburn Buccaneer. Hawker Siddeley built the Buccaneer for the Royal Navy, plus the South African Air Force during the 1960s, also a number of S Mk.2B aircraft for the Royal Air Force. Comet 4 – first flying as the de Havilland Comet airliner in 1949. The Comet 4 was still being built by Hawker Siddeley in the early 1960s. The final Comet 4 rolled off the production line in 1964. Dove – originated as the de Havilland Dove. Hawker Siddeley built the Dove during the 1960s. The last Dove was rolled off the production line in 1967. Gnat – originated as the Folland Gnat. Hawker Siddeley built a number Gnats during the early 1960s, for the Finnish Air Force, Indian Air Force and the RAF. Heron – originated as the de Havilland Heron. Built by Hawker Siddeley in the early 1960s. The Last Heron was rolled off the production line in 1963. Hunter – originated as the Hawker Hunter. The Hunter was still being built by Hawker Siddeley in early 1960s. The final Hunter rolled off the production line in 1966. Sea Vixen – originated as the de Havilland Sea Vixen. Hawker Siddeley built the Sea Vixen during the early 1960s. The last Sea Vixen was delivered to the Royal Navy in 1965. Vulcan – originated as the Avro Vulcan. Hawker Siddeley built the Vulcan during the early 1960s. The last Vulcan was delivered to the RAF in 1965. Hawker Siddeley Helicrane – a cancelled flying crane helicopter project in three variants, HS (Helicopter Small), HM (Helicopter Medium) and HL (Helicopter Large). The project was inherited from Blackburn, their Blackburn SP.62 design had six Bristol Siddeley turbojets in the rotor head exhausting at the rotor tips. Europa rocket – Hawker Siddeley built the first stage of the Europa rocket (derived from the Blue Streak). Sea Slug – Armstrong Whitworth surface-to-air missile. Taildog/SRAAM, an experimental missile that eventually turned into the BAE ASRAAM. The Canadian subsidiary produced rail cars, transit vehicles and engines (aircraft and ship). ^ "The Great Richmond Road aircraft factory". Hawker Association. Retrieved 1 March 2018. ^ "Company History | Brusk UK". The BRUSH Group. ^ "Invensys Rail: History". Invensys Rail Group. Archived from the original on 4 November 2008. Retrieved 7 November 2018. ^ "Brief History and Development Of Mirrlees Blackstone". Anson Engine Museum. ^ "Sir Thomas Sopwith to retire". Flight International. 2 December 1978. p. 1996. Wikimedia Commons has media related to Hawker Siddeley. Purchased rights for various Beagle and Handley-Page designs from the liquidator. Comprising Hawker Aircraft, Gloster Aircraft Company and Armstrong Whitworth Aircraft. English Electric Aircraft, a subsidiary of the English Electric Company. BAC comprised the aviation interests of the companies that formed it, and wholly owned Hunting Aircraft. GEC purchased EE and with it The Marconi Company and EE's shareholding in BAC, through its subsidiary EE Aircraft.